An odd but excellent novel, recommended to me by my brother Joseph. Gowdy captures so many ways of thinking which are spot-on, but which writers seldom manage to express so well. Also some memorable images (“I love you” as “a stupid surprise like a squirt in the face from a carnation”; not having had a lover in three years as “like owing the Mafia”). Falling Angels, Through the Glass Valley, and We So Seldom Look on Love. Translated into thirteen languages. Falling Angels, So Seldom We Look on Love, and Through the Green Valley. Falling Angels, Through the Green Valley, and We So Seldom Look on Love. Published in thirteen countries. 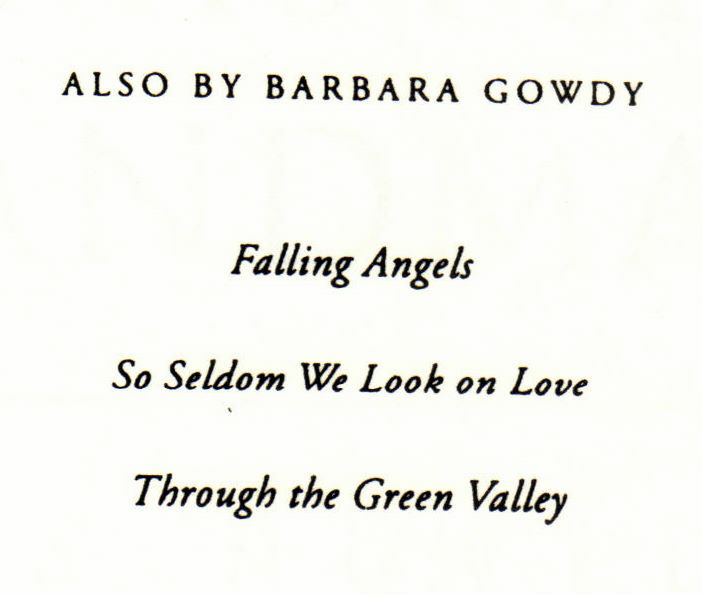 Only Falling Angels is the same on all three lists. There also seems to be some confusion over whether her books have been published in thirteen countries or translated into thirteen languages. I find this all almost awe-inspiring, the evident work of an anti-genius at Harcourt Brace & Company. Or perhaps Gowdy herself is behind it, laughing up her sleeve.